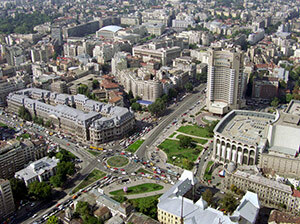 Bucharest is the capital of Romania and at the same time the biggest city of the country. It is also an industrial and trading centre. Inhabiting more than 2 million people, Bucharest lies on the 6th place on the list of the largest capitals from The European Union. The city was mentioned for the first time in 1495, as the residence of Vlad Tepes, the ruler of Walachia, but the town itself had existed before that time (it is supposed to have exited since the 14th century). The name of Bucharest was given by a peasant, called Bucur, but there’s no documentary attestation until the end of the Middle Ages. The attacks of the Turkish and Tartarian armies before the 17th century stopped the developing of the town. It eventually became the capital of Walachia in 1698 and developed during the peaceful period of the 18th century. Bucharest is one the first cities to be illuminated by gas. 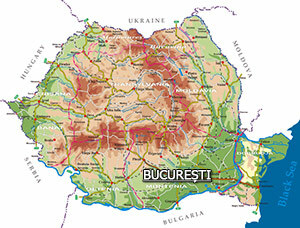 In 1862, Bucharest became the capital of Romania. 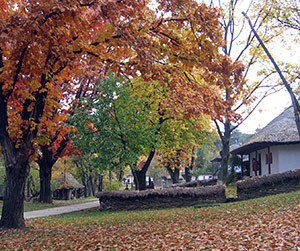 Museum of the Romanian Peasant. 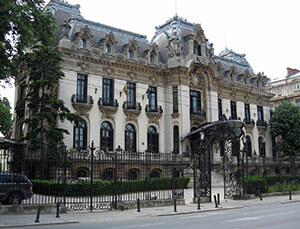 It is situated in Bucharest on Kiseleff Street, Number 3, near the Victory Square. The museum was build between 1912-1941, according to the architect N. Ghica-Budesti’s plans. The museum holds ceramics collections, traditional clothes, woven materials for the inside of the house, wooden items, furniture pieces, iron items, wall carpets, all of these being placed according to the main areas of our country and their traditions. There is also a shop here where you can buy various souvenirs. In the inner yard of the museum which leads to Ion Mihalache Boulevard, there is a wooden church, which is a historical monument belonging to the 17th century (the church was shifted here in 1992). It was founded in 1936 thanks to Professor Dimitrie Gusti (1880-1955), who is also the founder of the Romanian Sociology School. 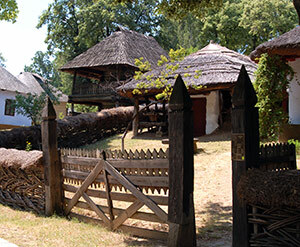 The Village Museum is one of the first ethnographic museums in the world and the second ethnographic museum placed outdoors in the world, next to Ethnographic Museum from Stockholm. Aiming at offering the best view of the life of the peasants, of their originality, of their remarkable artistic sense, the museum tries to recreate the intimate ambient of every house and succeeds in doing this, presenting to visitors elements specific to traditional households: barns, stables, fences made of wood, twigs or adobe, the simple or imposing gates, the inside of the house with the specific furniture pieces, working tools, traditional vessels, carpets and other woven items. 10 households were brought from Moldavia. They are the house from Straja (dating from 1760) and the house from Fundu Moldovei with large porch and balcony. Among the Dobrujda households, the most important are the house from Ostrov with a porch supported by two beautifully ornamented pillars, the Lippovan household (1898) and the fishing ground, both from Jurilocva. The traditional architecture from Walachia can be seen in the beautiful household from Chiojdu, which was built with boulders. It has a balcony supported by carved pillars and the balustrade is made of fret worked board. From Oltenia, two ancient houses were brought (the cottages from Draghiceni and Castranova), but among other households from this area of the country, the house from Curtisoara (dating from the beginning of the 19th century) is the most imposing, typical for the houses built on hills. Transylvania offers us a great diversity of buildings: the house from Salciua (The land of the “moti”-Tara Motilor) presenting a thatch, the simple house from Dumitra, made of twigs glued with clay, the house from Dragus, which is richly ornamented at the outside (towels, enameled ceramics, carpets etc). Among the technical installations placed in the museum, we mention the wind mill from Dobrujda, the pottery shed from Horezu, whirlpools set into motions by water etc. Besides houses, we can see other original monuments in the museum, such as: churches, water mills and wind mills, having a great historic and artistic value. 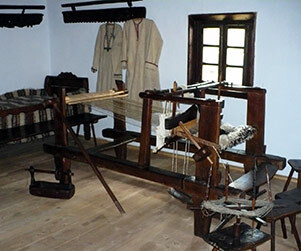 The items inside the houses (woven materials, vessels, carpets, icons and furniture items) show us the originality of the folk creation, the sensitivity and passion that peasants are capable of. It is the most important Romanian museum and it contains historical valuable items that have been discovered on the Romanian territory since prehistoric times till contemporary times.Important events concerning the developing of the museum happened in 1864, when General Nicolae Mavros donated a rich collection of historical items and when the decree nr. 71.098/25 was proclaimed and signed by the ruler Alexandru Ioan Cuza, decree that approved the regulations of the establishment of these collections and the functioning of the Antiquity and Natural Sciences Museums. It contains more than 50000 original pieces and documents belonging to various fields. Among the exhibits with great historical value, we may mention “The brood hen with golden chickens” (it dates from the 4th century AD-attributed to the Visigoth king, Athanaric), pieces from the famous “Pietroasa Treasure”, that weigh almost 19 kg, and also a copy of Trajan’s Column” from Rome. The National History Museum can be divided into more sections that are equivalent to the different periods of history: prehistory, ancient history, medieval history, modern and contemporary history. The exhibits from these collections are invaluable and are also the proof of the evolution of the society and civilization on Romanian soil. All these make the museum be a tourist objective, a must for those who haven’t visited it till now. There is also a shop inside the museum, where you can buy souvenirs, postal cards, brochures in Romanian and English languages presenting the museum. Guiding Taxes in Romanian: 20 lei (for groups of more than 10 persons). Royal Palace – The National Art Museum. 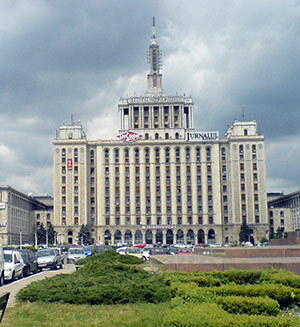 The edifice was built between 1927 and 1937 according to the Romanian architect D. Niculescu’s plans. In 1948, after the monarchy was abolished, The Royal Palace became the headquarters of the National Art Museum. Inaugurated in 1950, The National Gallery shelters the works of many famous painters, like Theodor Aman, Nicolae Grigorescu, Stefan Luchian, Nicolae Tonitza, Theodor Pallady and sculptors: Dimitrie Paciurea, Constantin Medrea, Ion Jalea and the famous Constantin Brancusi. The patrimony of the museum contains 4000 engravings and sketches belonging to several Romanian and foreign artists. The building is U-shaped, having an inner yard. The façade has two entries: the left entrance was used by the king and his guests and the right one was meant for the high officials. The Palace was seriously damaged during the Revolution in 1989, many of the items were destroyed because of the fires. The façade was destroyed as well by bullets, the windows were broken, as terrorists were supposed to be in the Palace. The restoring works began at the end of the 90’s and in 2000 the galleries were all opened in turn. Today, the Royal Palace is an extraordinary museum, but, unfortunately, the building cannot be entirely visited. The Hall of the Throne, for instance, is inaccessible to the public. This hall consists of three galleries and two collections of decorative art. 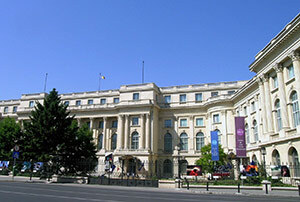 The European Art Gallery: is situated in the Kretulescu wing and has been recently re-opened. The paintings of the most representative painters of Europe can be seen here, painters from the Renaissance period till the first decades of the 20th century. Beside the painting collection of the Romanian Royal House, the masterpieces of the European Art can be as well admired: “Madonna with child” by Domenico Veneziano, “Haman begging Esther for forgiveness” by Rembrandt, “Man with ring” by Jan Van Eyck , “Camille” by Claude Monet, “The age”, “The kiss”, “The Spring” by Auguste Rodin stc. The Old Romanian Art Gallery: is situated at the first floor of Stirbei Sector and contains 9500 masterpieces, which are exposed in 7 halls. 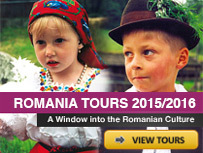 These items conjure up the cultural life from Walachia, Moldavia and Transylvania. In three of the 7 halls, you can see laic and cult items made of precious metals; jewelry and costume accessories belonging to 14th-19th centuries. The Modern Romanian Art Gallery: there are 8479 paintings and 1817 sculptors and it is situated at the second floor of the Stirbei Sector. One of the galleries is exclusively dedicated to the sculptor Constantin Brancusi and it exposes works from his youth and later years: “Torture”, “Child Head”, “The Slumber”, “Prometheus”, “Prayer”. The decorative art collection used to be part of the Universal Art Gallery, along side the European painting and sculpture and an assembly of Oriental Art items. The collection consists of nearly 10000 items of European Art, including Romanian Art as well, being the most important collection in Romania and exposes Romanian tapestry works, furniture pieces, ceramics, a collection of clocks and also silver ware items done in Augsburg, Berlin or Nurnberg. The Oriental Art collection gained its autonomy in 1990 and it contains the most representative set of items from The Islamic Orient, China and Japan that have ever existed in a Romanian museum. There are almost 400 carpets, woven items, paintings, ivory items, Chinese and Japan porcelains, wooden sculptures, weapons and textiles. Grigore Antipa National Museum of Natural History. “Grigore Antipa” National Museum of Natural History possesses a great patrimony that includes zoological, palaeontological, ethnographic, minerals and rocks collections. Thanks to the researches done by specialists from abroad and Romania, the donations and acquisitions, the collections of the museum have constantly developed, so that today there are more than 2 millions items. It is the largest and oldest museum of this kind among all the Danubian countries, including more than 3000.000 exhibits. The richest and most important collection of butterflies in the world can be found here. The museum was founded in 1908. The first collections were donated in 1834 by “St. Sava” College. 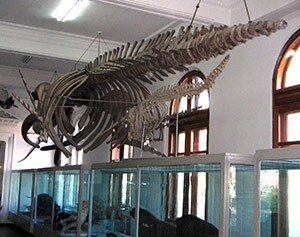 These collections represent the basis of the museum, which contains today many exhibits, belonging to various fields: ecology, zoology, oceanography, paleontology, taxonomy, morphology. In the library of the museum, 30200 book volumes and 20000 periodical magazines are inventoried. 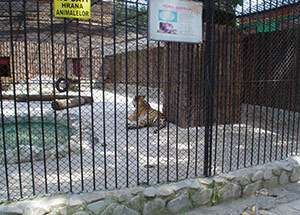 It is situated in the northern part of Bucharest. The Triumphal Arch was built in 1922 and it is made of wood and plaster. 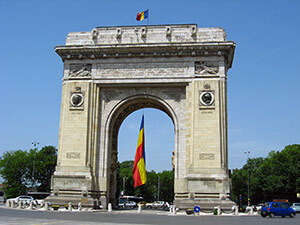 This arch was built, as a celebration for The Great Union, after the victory of the Romanian armies in the World War I. This wooden arch was replaced by a stone arch somewhere between 1935 and 1936 (this was architect Petre Antonescu’s work). The southern façade is beautifully ornamented with two bronze medallions that present the faces of King Ferdinand and Queen Maria. During the Communist Regime, these two faces were replaced by two big flowers, but after 1989, the royal faces regained their places on the arch. Above each medallion, there is a victory carved in bold relief, which are the works of the sculptors C. Baraski and M. Constantinescu. On the northern façade, there are two other medallions on which two symbols are carved: “Manhood” and “Faith”. “Manhood” presents a warrior with a sword (work belonging to I. Jalea) and “Faith” is symbolized by a young man with a cross and was created by C.Baraski. The victories above these silhouettes are created by the sculptors D.Onofrei and C.Medrea. 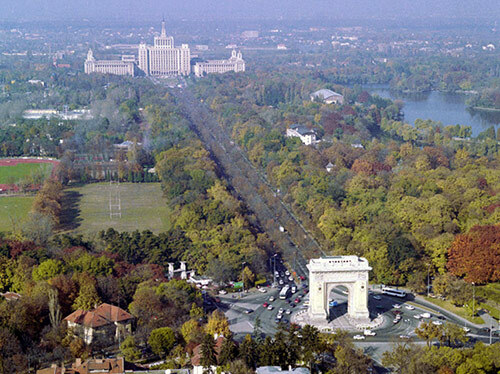 The names of the battles from World War 1 are carved (Marasesti, Oituz etc) on the voussoirs of the Triumphal Arch and King Ferdinand’s proclamations towards the people when Romania entered the war can be seen carved on the lateral facades of the arch. The Triumphal Arch can be considered an imposing monument, together with the Coronation Cathedral from Alba Iulia, the Mausoleum from Marasesti, the Cross of the Heroes on the Caraiman Mountain and the Monument of the Unknown Hero from Carol Park. 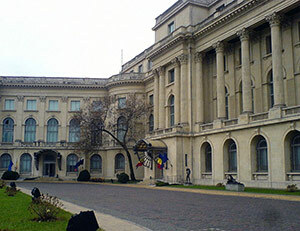 Founded by the decree of the ruler Alexandru Ioan Cuza and being the successor of the higher education structures inaugurated by the Princely Academy (1694), the university from Bucharest has contributed and still contributes nowadays to the developing and modernizing of education, science and Romanian culture. The university from Bucharest is one of the most important institutions of higher education in Romania, institution that offers many studying programmes reaching all levels of university preparations: 22 programmes on short term, more than 75 programmes on long term, 12 programmes of open and distance education, more than 120 master degree programmes, more than 50 doctor’s degree programmes, programmes of higher post university studies, programmes of professional and perfecting conversion. All these programmes are accredited and authorized. The degree diplomas emitted by the university from Bucharest are recognized in most of the other countries of the world. 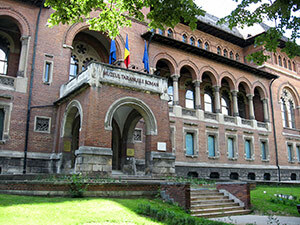 Many of the graduates of the university became important personalities: professors and researchers working in the greatest universities of the world, members of the Romanian Academy and of some other academies in the world, writers, politicians ( members of the Parliament, ministries, prime ministers, presidents), diplomatists, high prelates. The university consists of the following faculties: Faculty of Biology, Faculty of Chemistry, Faculty of Philosophy, Faculty of Law, Faculty of Physics, Faculty of Geography, Faculty of Geology and Geophysics, Faculty of History, Faculty of Journalism and Communication Studies, Faculty of Foreign Languages and Literatures, Faculty of Letters, Faculty of Mathematics and Computer Science, Faculty of Psychology and Educational Studies, Faculty of Political Science, Faculty of Baptist Theology, Faculty of Orthodox Theology, Faculty of Roman-Catholic Theology and Social Work. 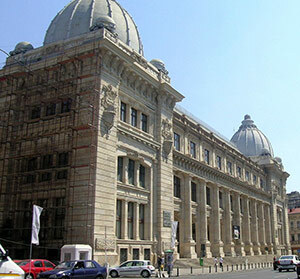 The Higher Education Supplement ratings placed the university from Bucharest among the first 500 universities of the world in 2007. What the fields of activities are concerned, the ranks are as following: Humanist Arts and Sciences-277, Social Sciences-330, Engineering and Technology of Information-336, the Science of Life and Biomedicine-427, the Sciences of Nature-447. Recently, due to the selection of all the Romanian scientific publications which are put on the index by Thompson ISI in Essential Science Indicators, our University has been placed on the 641st position regarding the Chemistry studies (from the 858 Chemistry departments nominated), on the 543rd position, what Physics is concerned (from the 642 nominated departments), and on the 720th position regarding Engineering (from 995 nominated departments). The Patriarchal Cathedral is a church from Bucharest, situated on the Patriarchy Hill, founded by Constantin Serban Basarab Carnul and his wife between 1654 and 1658. The celebration day of the church is “The Holy Emperors Constantin and Elena”. 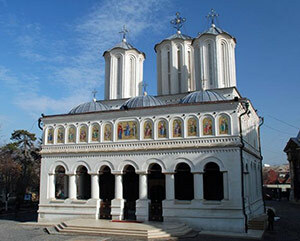 The church was sanctified by Mihnea the Third Carnul in 1658 and short afterwards, it became a Metropolitan Church. After World War I, the Metropolitan Church became a Patriarchy. There is no information about the architect that coordinated the building of the edifice. Only the names of the high officials that watched over the building of the church are still known: Chancellor Radu Dudescu and Gheorghe Sufariu. Regarding the general aspects of the church, it can be said that it is a copy of the Church from Curtea De Arges. As for its architectonic features, The Patriarchal Cathedral is considered one of the most valuable historical monuments belonging to the Walachian religious art from the 17th century. Stylistically speaking, it is an imposing creation that contributed to the developing of Romanian art, during Matei Basarab’s (1632-1654) and Constantin Brancoveanu’s reign (1688-1714). 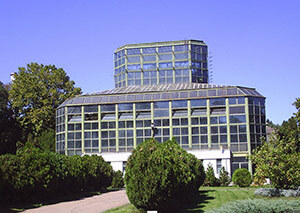 Situated in Cotroceni neighborhood from Bucharest, “Dimitrie Brandza” Botanical Garden of the University from Bucharest is an institution of culture, education and research. It was founded in 1860 during AL.I.Cuza’s reign. 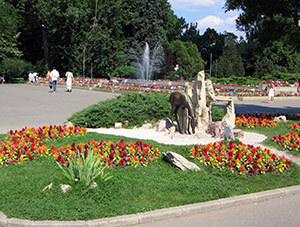 Nowadays, it has an area of 17, 5 ha and it is organized into sectors: outdoor sectors, populated by annual and perennial plants, (the decorative sector, the sector of rare plants, the sector of Mediterranean flora, the sector of Dobrujda flora, “Italian Garden” Sector, the collection of iris flowers, the sector of useful plants and the systematic sector), exhibit greenhouses that shelter the special compounds for plants belonging to different regions of the planet ( palm trees, orchids, exotic ferns, tropical and subtropical plants, succulent plants, cactus plants, bromelii) and production greenhouses. 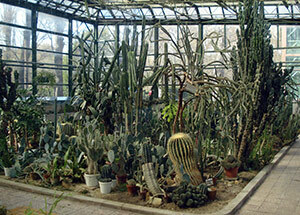 The collections of plants consist of almost 5000 taxa. This institution sets also a Botanical Museum at students’, researchers’ and visitors’ disposal, museum that is organized on ecological principles. There are also a Herbar General (BUC) (comprising almost 500 000 sheets) and Botanical Bookshop with more than 9000 books. “Dimitrie Brandza” Botanical Garden publishes the book “Acta Horti Botanici Bucurestiensis” (there have been written 35 volumes so far) and “Delectus Seminum”, which is a publication used for national and international exchange of seeds. 8:00 AM – 7:00 AM (during the summer); 9:00 AM – 5:00 PM (during the winter); Monday: closed. It was founded in 1955, lies on a surface of 5, 85 ha and possesses 104 species and subspecies, summing 835 exemplars belonging to 3 classes of vertebrates: 6 species of reptiles (24 exemplars), 49 species of birds (591 exemplars) and 49 species of mammals (219 exemplars). The House of the Free Press. At first it was named “Casa Scanteii” Complex and it was built in 5 years (1952-1957), being meant for publishing the press of the state, especially for the publishing of the newspaper Scanteia, which was an “organ” of the Central Committee of the Romanian Working Party. The aerial that was fixed on the roof of the building in 1956 served for a while as the transmitter of the Romanian Television. After 1989, Casa Scanteii (The House of the Spark) has been known under the name of the House of the Free Press. This building, which can be considered the home of tens of publications, publishing houses and printing houses, covers an area of 280/260 meters. Without the television aerial, the building is 96 m tall and with it, the building is 104 m tall, being even taller than the Intercontinental Hotel, which is only 86 m tall. The construction of Casa Scanteii was possible through the so called public subscription. People donated or better said, they were forced to donate money in order to fulfill the goal of the Party. The donation consisted of nominal coupons that had the value of 20, 30 or 100 lei. The pride of the Communist Regime was so great, that its new symbol was printed on the back of the 100 lei banknotes in 1952. What the architectural style is concerned, the building is dominated by the realist-socialist style, having also strong Stalinist influences. During the Communist Regime in Romania, there was a trend to copy everything that existed in Moscow. This way, Romania and the other countries from the Communist Block proved their loyalty and servitude to USSR. Therefore, Casa Scnateii follows loyally the architecture of “Lomonosov” State University and “Leningrad” Hotel, both from Moscow. On the 21st of September 1960, a huge statue portraying Lenin realized by the sculptor Boris Caragea was placed in the front of the building. This statue was eventually removed on the 3rd of March 1990, its removal became part of the healing (or revenge) process that the people from Bucharest were going through after the terrible life they had previously led in the Communist Regime. Today, there’s a simplistic monument that takes the place of the statue, even if its base is still there. 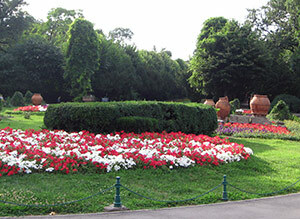 Cismigiu Garden is one the oldest public gardens from Bucharest. It is situated in the centre of the city, has an area of almost 16 ha and it is limited by two important streets: Queen Elisabeth Boulevard and Schitu Magureanu Boulevard. In the south-eastern part of the garden, you can see “Gheorghe Lazar” National College. 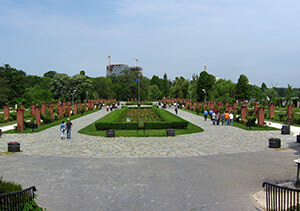 Cismigiu Garden is organized in the manner of the English parks. The history of this place begins in 1779 when the ruler of Walachia, Alexandru Ipsilanti ordered that two drinking fountains to be built, so that he could drink fresh water. The name of the park comes from these two drinking fountains (cismea=drinking fountain), because the leader of the workers hired for building the fountains had a nickname, and namely “The Big Cismigiu”-meaning the greatest over all drinking fountains. The planning works of the park began under the reign of the Viennese architect Frederich Wilhelm Meyer. In those times, there was here a place full of marshes, reeds and club rushes. Once the park started to be built, all of these plants disappeared and a public garden with alleys and an artesian well in its centre was created instead. More than 30000 native tress are planted; rare species as well. There are some man-made grottos, floral carpets, bridges and benches. Cismigiu Park was not built all of a sudden, but gradually. Its area was extended with a parcel bought from the garden of the Cretzulescus. Exotic fishes, swans and pelicans were also brought here. Later on, a small zoological garden was founded as well: bears, wolves, foxes and beavers. In 1852, the park was eventually fenced in. The Ministry of Interior has showed a lot of interest what this garden concerned over the years and allowed also several public attractions. Walking on the alleys is allowed only till 22 o’clock and on shinny nights (till midnight), no one may enter the garden riding a horse or with a coach (the same rule is applied for dogs or any other animals). The peddlers were forbidden long ago to enter the garden. The ones that would step on the grass or tear the flowers were punished. Cismigiu Park consists also of a wide French garden, the Writers’ Rotunda, The Romanian Round and also a rose garden and three lakes. On one of the lakes, there is an island and a landing stage where boats can be borrowed from. The park is by far loved not only by people from Bucharest, but by anyone that takes a rest here for a short while. During the winter, the lake becomes a great skating ring. Herastrau Park or Carol the Second National Park was built in 1936 on the banks of the lake Herastrau and it is the greatest park in Bucharest. Its area is almost 110 ha. 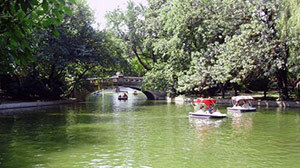 Before 1930, the place on which the park is nowadays situated was a swampy area that was ditched between 1930 and 1935. With this occasion, the problem of managing the rest of the area was put into question, taking into consideration that the Triumphal Arch was situated nearby. In 1948, this entertaining place was named Herastrau Park. Among the most important entertaining activities, we can mention a summer theater, exhibition pavilions, terraces and restaurants. 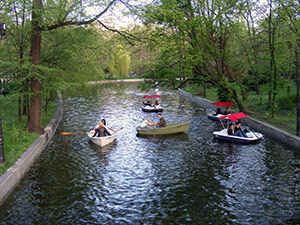 Herastrau Lake has an area of 77 ha and it’s an entertaining placed, used for water sports as well. There are motorboats, hydro-bicycles and small ships. Spots for tourist attraction: Roses Island, which leads to the Village Museum on one hand and serves as a link to the rest of the park, on the other hand. The Japanese Garden was built in 1998 with the help of the Japanese Embassy from Romania and the commemorative foundation of the World Japanese exposition. “The Alley of the Caryatides” created by the sculptor Constantin Baraschi was very spectacular when it was released during the “Lunii Bucurestilor” Holyday in 1939, as it was and still is the re-shaping of a Greek classical element after the Romanian style. The statue representing General de Gaulle lies at the entrance that leads to Charles de Gaulle Square and was uncovered with the occasion of the Francophone Summit from Bucharest in September 2006. It is 4, 7 m tall and weighs almost 5 tones. It was built according to architect I.D.Berindei’s plans in the French Baroque style (1956). “George Enescu” Memorial Museum was inaugurated in Cantacuzino Palace and after 1990 it became a national museum. Beside the violin that Enescu received when he was 4, one can find here the scores of his works, diplomas and medals that he won, the most important one being the medal of the French Legion of Honor. “George Enescu” Memorial Museum was inaugurated in Cantacuzino Palace. 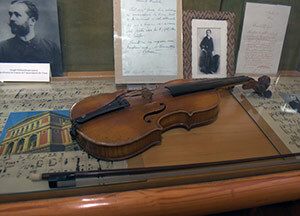 You can find here the violin that Enescu received when he was 4. The edifice (declared an architecture monument) has four levels: a basement that represents the base of the building, a ground floor with circle arch-shaped windows and with banisters made of stone, a floor with straight windows equipped with forged iron balconies and an attic cu richly ornamented skylights. The interior is decorated with monumental paintings realized by G.D.Mirea, Costin Petrescu, Arthur Verona, Nicolae Isidor Vermont and sculptures realized by Fr. Storck and Em. W. Becker. Its façade is dominated by the entrance, neatly unhooked, preceded by ample stairs made of marble, “defended” by two stony lions. The Palace served as the residence of the Ministries’ Council, just before the World War II was about to burst. 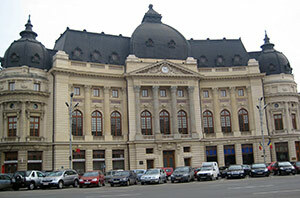 The National Theater from Bucharest was inaugurated in 1852. It is a public and national institution, belonging to the Ministry of Culture and Cults. Its main objective is to promote the autochthonous and universal cultural-artistic values, on national and international scale. There are 4 halls dedicated to theater plays: The Big Hall (1.155 seats), The Amphitheater Hall (353 seats), The Workshop Hall (without a fixed stage, 94-219 seats) and The Studio Hall 99 (without a fixed stage, 75-99 seats). During more than 150 years of existence, The National Theater from Bucharest has offered the most significant plays from the universal dramaturgy to its audiences. Successful performances have taken plays both in the country and abroad: French, Germany, Austria, Yugoslavia, Italy, England, Spain, Portugal, Greece, Brazil etc. Among the great personalities that led the theater in the past, we can mention: Costache Cragiale, Matei Millo, C.A.Rosetti, Alexandru Odobescu, Ioan Ghica, Grigore C. Cantacuzino, I.L.Caragiale, Alexandru Davila, Pompiliu Eliade, Ion Bacalbasa, Constantin Radulescu-Motru, Victor Eftimiu, Ion Minulescu, Liviu Rebreanu, Ion Marin Sadoveanu, Camil Petrescu, Haig Acterian, Nicolae Carandino, Tudor Vianu, Zaharia Stancu, Radu Beligan, and Andrei Serban. The theater was called “The Great Theater” till 1875 when Alexandru Odobescu, the then director, changed its name: The National Theater. In 1879, the premiere of the play “O noapte furtunoasa” by I.L.Caragiale took place. In 1884 and 1885, two other plays by Caragiale debuted here (“O scrisoare pierduta” and D’ale carnavalului, respectively). According to many historians and researchers, The Romanian National Library has its origins in one of the oldest and most representative libraries in Romania, and namely The Library of “St. 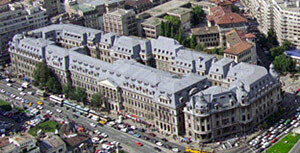 Sava” College from Bucharest. This library was opened in 1838 and almost 1000 French book volumes were catalogued. After The Union in 1859, The Library of “St. 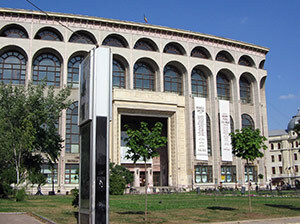 Sava” College achieved the rang of national library and also the name of National and Central Library. In 1864, due to the law of public regulations, the name of the library changed again into The Central State Library, name that was kept till 1901. 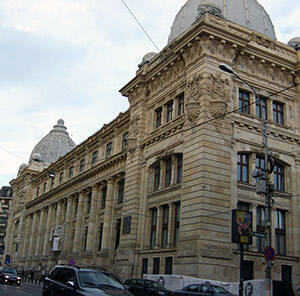 At this point, the library is abolished and its collections were transferred to The Romanian Academy Library which achieved the name of national library instead. Only the patrimonial function could be considered at that time relevant for the library. 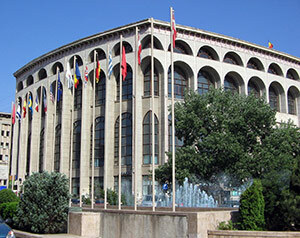 In 1955, the book funds were transferred back to the early established library, The Central State Library, the main public library in Romania. 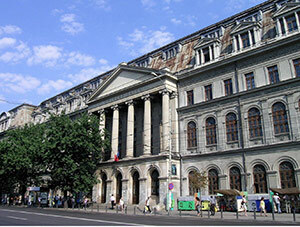 As soon as the Communist Regime was taken down, The Central State Library became The Romanian National Library (January 1990), as a decision adopted by the new government. The Romanian National Library manages the national cultural patrimony of published books, periodical magazines, manuscripts, old books, incunabula, maps, photos, audiovisual materials and electronic documents. The collections of the library contain almost 13.000.000 bibliographic units of encyclopedic nature, units that are organized in current funds-Romanian and foreign publications (books, newspapers and magazines) and funds of the special collections (bibliographies, manuscripts, historic archives, old Romanian periodical magazines, stamps, photos, cartographic and audio-visual materials). Situated on the “Lascar Catargiu” Boulevard, ”Admiral Vasile Urseanu” Astronomical Observer is in fact a museum like institution, meant for the popularization of astronomy. 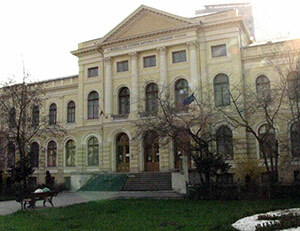 It is in fact a subunit of the Bucharest Municipality Museum. Among the facilities it provides, the interested ones have the opportunity to watch the sky through a telescope. 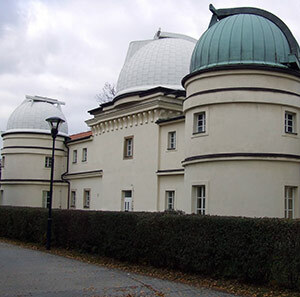 The museum was founded in 1909 and presents the history of astronomy, Admiral Vaslie Urseanu’s original telescope, various manuscripts and a library. The price of a ticket: Adulta – 4,08 lei; Pensioners, students and pupils – 2,04 lei. Other taxes: photo tax for regular tourists – 15 lei; photo tax for professional photographs and filming tax for documentary movies – 35 lei / ora. Your descriptions are very good with only an exception, you have presented the National Library with the photos of the Central University Library, the former Carol I University Foundation! 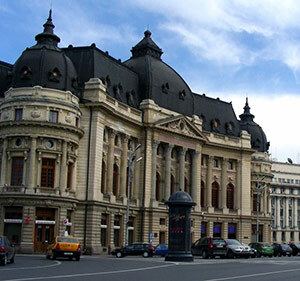 I most certainly hope to visit Bucharest in 2011 and see the wonders of this incredible city!! Hallo,i have a question,is it real that in your museum is a specimen of a giant Silurus Glanis ( Somnul),that weight around 400 kg,caught by the naturalist Grigore Antipa? Can i get a pfotography of this giant fish? I want to visit the Curta Veche and The Arch of Triomph in Bucarest. Could you tell me the fee for each visit ? And I wnat to visi the oldest synagog in jew quarter. Do I have to pay a fee ? Could you confirm there is the Old Bucharest Festival on May 31 2010 ?